As preparations and celebrations unfurl for the 2018 FIFA World Cup kick-off in Russia tomorrow, AN has rounded up our favorite up-and-coming projects (and new sports venues) across the country. 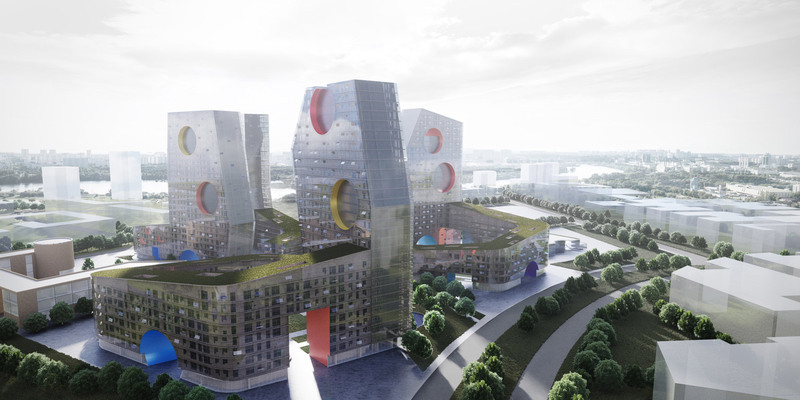 From James Bond-esque houses and parachute-themed neighborhoods to massive new developments, Russia has provided a playground for high-profile firms to experiment with new forms. 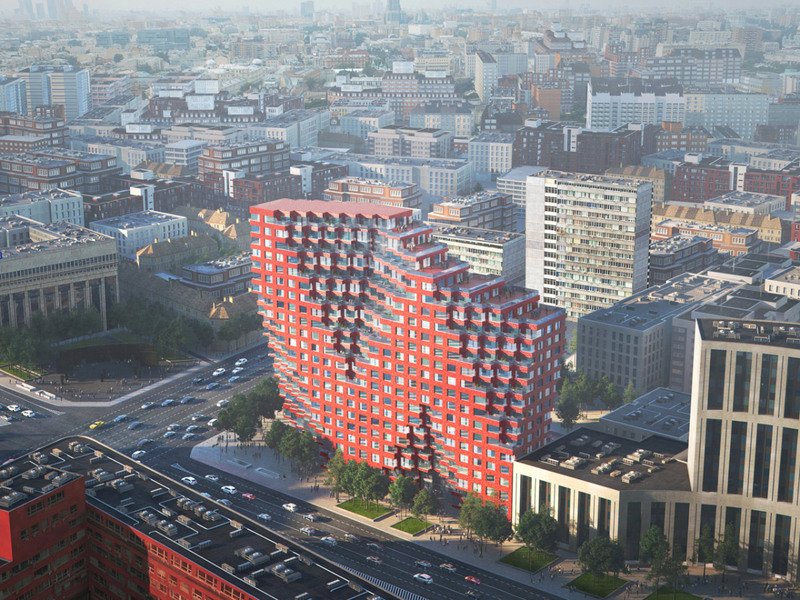 The modular Silhouette was the result of a design competition that concluded in January of this year and will serve as a “gateway to Moscow” once completed. The 256-foot-tall, mixed-use complex contains a bit of everything—luxury apartments on the top floors and a roof terrace, offices, a sports center, and a grocery store at its base. The pixelated tower block will be clad in a red ceramic tile, and the form takes cues from abstractions of Moscow’s skyline and the constructivist Ministry of Agriculture building across the street. The extrusions and sculptural cuts at the building’s base were carefully planned to create an inviting presence at ground level. Steven Holl Architects and Kamen Architecture Art-Group have proposed a new “Parachute Hybrids” typology for their residential development in Moscow’s Tushino district. Drawing inspiration from the site’s history as a former paratrooper airfield, the vertically-oriented slabs and horizontal bases have been run through with circular cuts reminiscent of parachutes drifting through the sky. Tushino will offer residences of every type and target every income bracket, while a new kindergarten and elementary school will serve residents in the development. The recently completed Capital Hill Residence was the only private house designed by Hadid herself, and the towering form bears all of the late architect’s signature biomorphic curves. 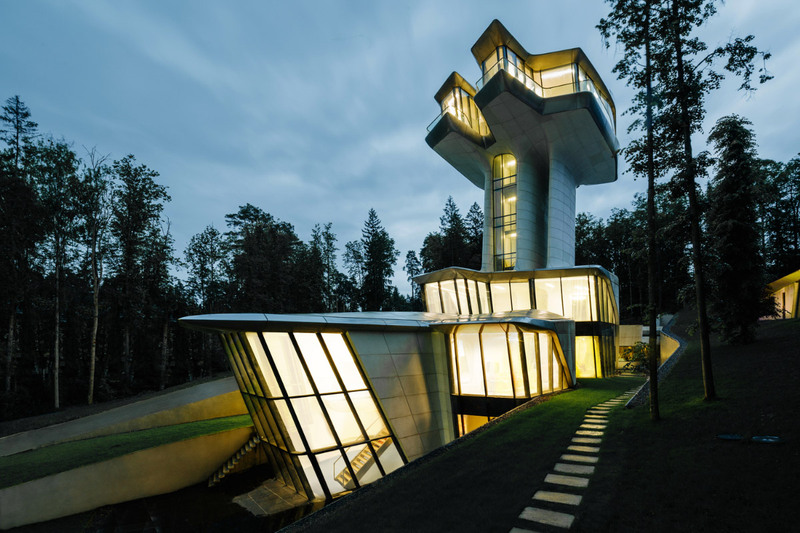 Rising above the tree line of the Moscow’s Barvikha Forest like an emerging submarine, the house’s prominent “mast” seemingly floats 72 feet above the landscape and provides sweeping views. The building’s base gradually tapers into the earth below and provides a private area for the homeowner to retreat to. 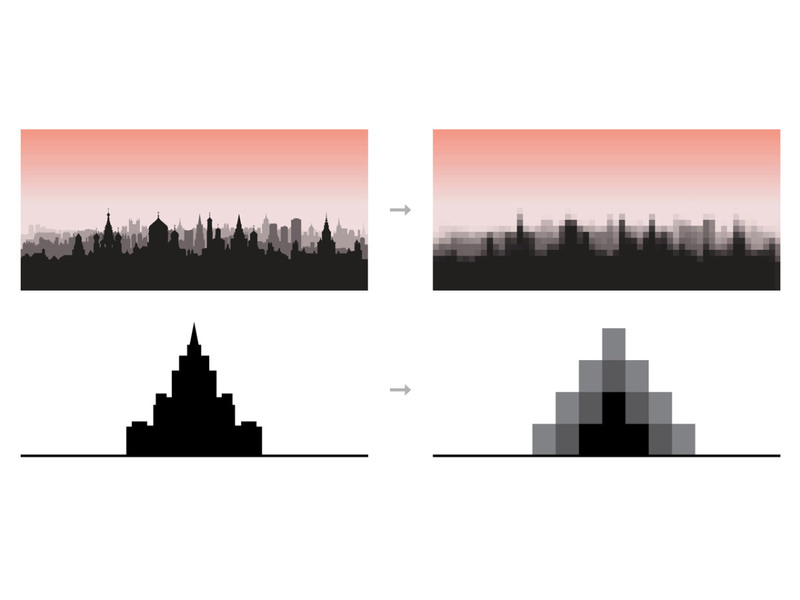 The organic shape of the concrete and dramatic change in elevation is meant to give viewers the impression of something fast-moving and fluid. ZHA will be responsible for revitalizing nearly 35 acres of coastal neighborhood along the Black Sea in Novorossiysk at Russia’s largest port. Residents can expect new opportunities for outdoor leisure activities on the Black Sea, a new port, marina, new piers, and a weaving of the new areas into the city’s existing urban. 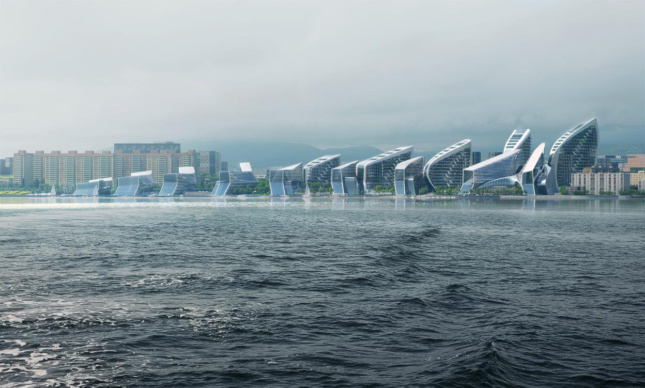 The master plan will also bring nine new buildings to the waterfront, each representing a different stage in a sequential iterative design, creating a sweeping, wave-like skyline in the process. The one million square feet of new space will be used for a hotel, civic and conference spaces, and offices. The project is moving quickly, and construction on the first phase will begin in the second half of 2019. 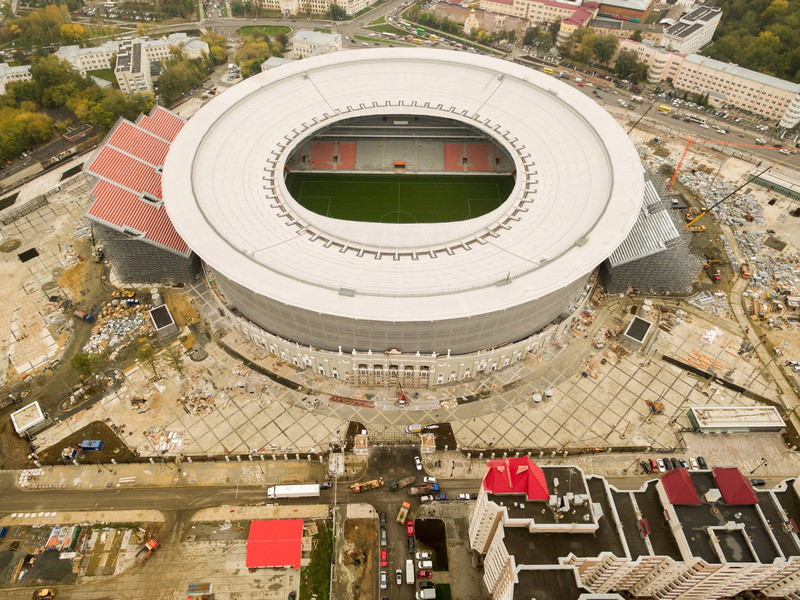 Originally built in 1956 as the multi-sport Central Stadium, Ekaterinburg Arena was recently renovated in 2011. Although it was modernized, the arena’s 20,000-seat capacity meant that another round of work would be needed to bring the arena up to FIFA’s 35,000 seat minimum. Another renovation took place in 2015 that saved the building’s historic facade and increased the stadium’s capacity, but temporary seating to bring the arena’s capacity up to 45,000 seats was still needed, and has been installed behind both goal areas for the four World Cup games being played there. A spiraling lattice swirls around the base of Volgograd Arena, one of the stadiums built for this year’s World Cup. 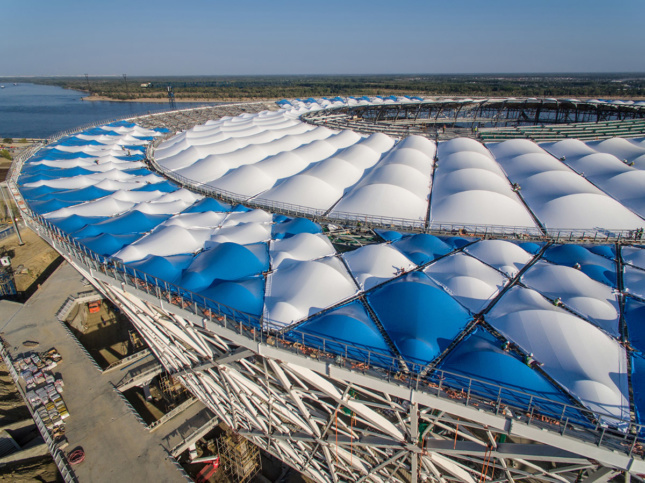 The project was built on a budget, but the exposed superstructure, squat single-piece form, and colorful cable roof makes it architecturally distinct from many of the Soviet-era venues made from concrete. After the World Cup, Volgograd Arena will have its seating capacity reduced down to 35,000 and the stadium will become the new home of local football club Rotor Volgograd. A light and airy stadium at the fork of two rivers, Nizhny Novgorod Stadium was designed with elements of air and water in mind. The white-and-blue color palette and spacious use of columns to create open-air areas helps lend the stadium a feeling of openness. At night, the building emanates light from the top and sides through its semi-transparent facade. The stadium was commissioned for the 2018 World Cup and was completed last year. 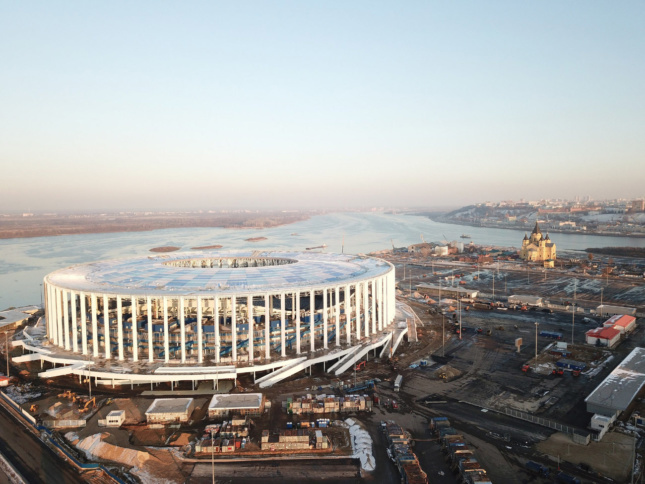 The building boasts a 45,000-seat capacity and will be handed over to football club Olimpiyets Nizhny Novgorod after the World Cup is over.